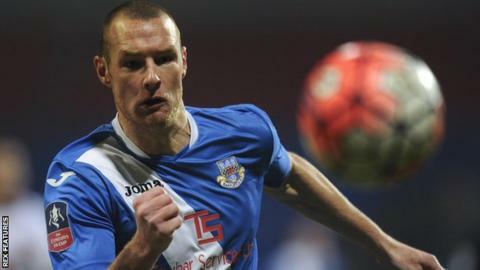 Eastleigh scored twice in the first 30 minutes on their way to a comfortable win over Barrow to move to within a point of the final play-off place. Matt Tubbs crossed for Luke Coulson to head the opener before James Constable nodded in to double their advantage. Mid-table Barrow came into the game on a 10-game unbeaten run and Andy Cook halved their deficit from a corner. The Spitfires eventually killed off the visitors, Ben Strevens tapping in after his penalty kick was saved. Match ends, Eastleigh 3, Barrow 1. Goal! Eastleigh 3, Barrow 1. Ben Strevens (Eastleigh) right footed shot from the centre of the box to the bottom right corner. Penalty saved! Ben Strevens (Eastleigh) fails to capitalise on this great opportunity, right footed shot saved in the centre of the goal. Second Half ends, Eastleigh 2, Barrow 1. Penalty conceded by Alex-Ray Harvey (Barrow) after a foul in the penalty area. Penalty Eastleigh. Andy Drury draws a foul in the penalty area. Attempt saved. Yemi Odubade (Eastleigh) right footed shot from a difficult angle on the right is saved. Attempt saved. Andy Drury (Eastleigh) right footed shot from the right side of the box is saved. Assisted by Ross Flitney. Attempt saved. Nick Wilmer-Anderton (Barrow) right footed shot from the left side of the box is saved. Attempt saved. Andy Cook (Barrow) right footed shot from the left side of the box is saved. Assisted by Brad Abbott. Simon Grand (Barrow) is shown the yellow card for a bad foul. Foul by Simon Grand (Barrow). Jack Midson (Eastleigh) wins a free kick. Foul by Ben Tomlinson (Barrow). Jai Reason (Eastleigh) wins a free kick. Substitution, Eastleigh. Jack Midson replaces James Constable. Ben Strevens (Eastleigh) wins a free kick. Foul by Jordan Williams (Barrow). Foul by Jai Reason (Eastleigh). Alex-Ray Harvey (Barrow) wins a free kick. Attempt missed. Luke Coulson (Eastleigh) right footed shot from long range on the right misses to the right. Attempt blocked. Yemi Odubade (Eastleigh) left footed shot from the left side of the box is blocked. Attempt missed. Danny Livesey (Barrow) header from a difficult angle on the left misses to the right. Assisted by Jordan Williams. Substitution, Eastleigh. Yemi Odubade replaces Matt Tubbs. Offside, Barrow. Jordan Williams tries a through ball, but Jordan Williams is caught offside. Michael Green (Eastleigh) wins a free kick. Foul by Brad Abbott (Barrow). Foul by Andy Cook (Barrow). Joe Partington (Eastleigh) wins a free kick. Attempt saved. Andy Cook (Barrow) left footed shot from a difficult angle on the left is saved. Assisted by David Symington with a cross. Substitution, Barrow. Brad Abbott replaces Andy Haworth.